Guest of honour and Supreme Leader was undoubtedly Kim Jong-in, who proceeded to throw his weight around and threaten doom on anyone who disagreed with him. The wall shown below came complete with a marker pen on which insults to K J-in and others could be composed with anonymity (and animosity). This man (does he have unusually large hands, or is that a strangely small glass?) arrived with helmeted protection and a radioactive jacket. Other participants kept a wide berth. I followed the convoy of bikes to the Bird in Hand, just down the road from the ‘Mop’. Good beer, and half the price (£2 a pint) at the Bird in Hand, an excellent spot. The bikes used by attendees were not all state of the art, but included some classic models. My visit was somewhat fleeting, as I was only reminded of the event via an email from JJ at 10.30, and as the cycling route from Timperley was not off road, discretion regarding alcohol intake was warranted. It worked well – I set off after the rain had stopped, and I was home before it started again. Others entering more whole-heartedly into the occasion may not have been so lucky. Here’s my 33 km route – click on the image to enlarge it a bit. Thanks to JJ for reminding me about this, and I’m sorry that my visit was rather brief. Whilst I dashed off a few quick postings during the weekend, I’m now back at home with time to process the (few) photos and add a bit of detail. Before wending my way up the roads north to Newtonmore and my abode for the weekend, pictured above, I’d arranged to meet Jayme in Lancaster for their parkrun. He kindly ran with me, though I suspect our chatting may have slowed me a little! The run is based in Williamson Park, starting next to the Ashton Memorial, an Edwardian Baroque folly built between 1907 and 1909 by millionaire industrialist Lord Ashton in memory of his second wife, Jessy, at a cost of over £80,000 (equivalent to £7.5 million in 2015). The route, which involves two hilly laps, is shown below. There’s a good café next to the memorial, so Jayme and I could relax and in my case recover (Jayme didn’t need to – he is super fit after last Sunday’s Manchester Marathon) and look forward to forthcoming trips to Mallorca (he’s there now) with anticipation. 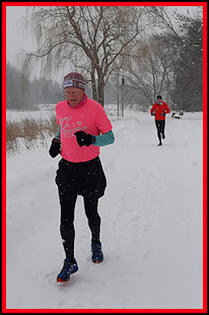 The parkrun results are here. Interestingly, first to finish by some margin was an 11-14 year old girl. Well done to her. Nearly everyone in Heather’s party arrived in Newtonmore at about the same time on Saturday afternoon. Some dog walking took place before we enjoyed a fairly lavish supper at the hostel, comprising various delicacies brought along by those attending. Sunday looked as if it would provide the best weather of the weekend, so I eschewed the short social walk on offer and took my bike to Dalnacardoch for a 9 km ride beside Edendon Water to Sronphadruig Lodge. Here’s the view towards my first hill, An Dun, from a bridge about half way up the glen. 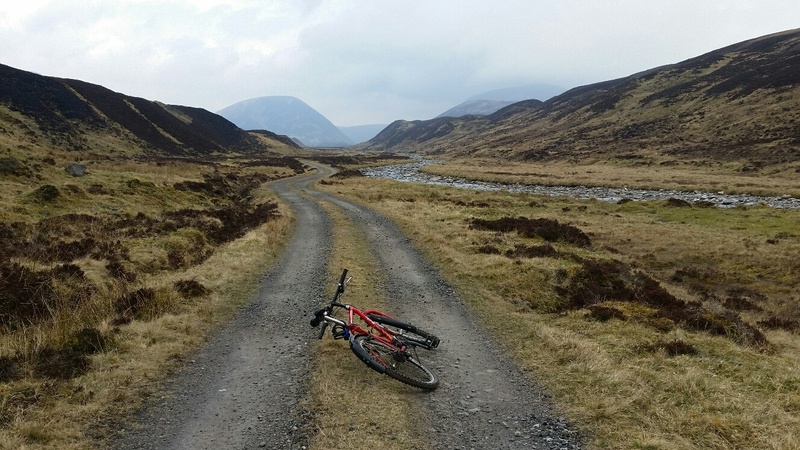 The bike was abandoned next to the fenced in remains of Sronphadruig Lodge. The walk up An Dun is straightforward but steep, directly up the nose in the centre of the picture. There are two summits, the first appearing, about 30 metres from a cairn, to be a little higher at 827 metres. But the north top is also 827 metres and a recent survey concludes that both summits are to all intents and purposes the same height. I went to all the candidates for ‘highest point’. Here’s the view to Maol Creag an Loch from the north summit. Rain was forecast later, but the weather held for me – it was a bit grey, but there were sunny periods and reasonable views as I descended carefully down the steep slopes towards the lodge, which is to the left of the river in this picture. Lunch was taken in a sheltered spot below Maol Creag an Loch. 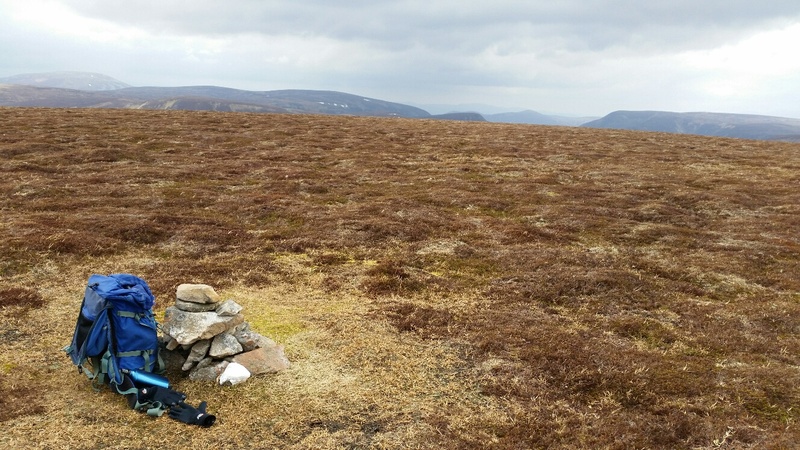 There were good views beyond An Dun towards the sunlit Carn na Caim area above Dalwhinnie. The cairn on top of Maol Creag an Loch does appear to be located at its 876 metre summit, from where An Dun appears as an insignificant foreground ridge in the view towards the Munro summits to the east of the A9 near Dalwhinnie. 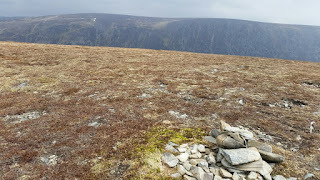 There are thin trods going to both An Dun and Maol Creag an Loch summits, the latter being a little longer but much easier and perhaps a little quicker. Back at Sronphadruig, a small tent that I’d passed on the way up was still securely sealed; its owner was presumably using it as a base for a longer walk. Here’s my 12.5 km walking route, including about 800 metres ascent, and taking a little under 4 hours including breaks. The 18 km cycle ride isn’t shown – it took an hour to cycle in and half an hour to cycle back down to Dalnacardoch, 9 km each way, saving a couple of hours compared with walking. Later, another ad hoc meal, mainly courtesy of Heather. Delicious. 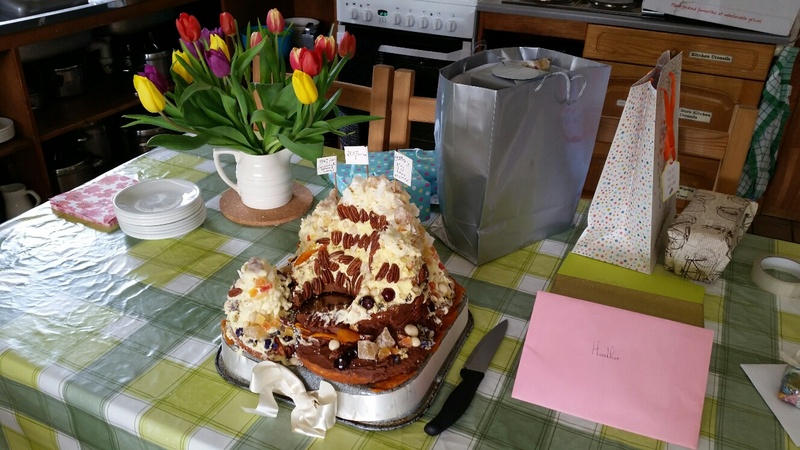 Monday was Heather’s birthday, celebrated with lots of cards and presents, and a magnificent cake with at least five differently flavoured layers, lovingly constructed by her mum. There were lots of rock bands to negotiate. 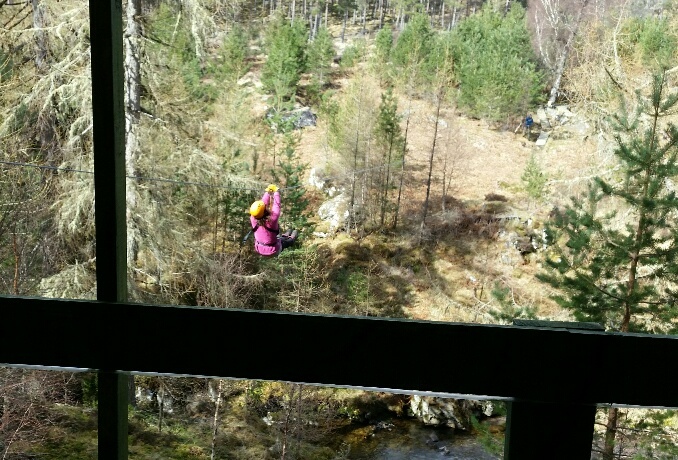 After a leisurely morning, the group of 15 went to the ‘Zip Trek Park’ near Aviemore. It was a 2 km walk up to the start of the ‘experience’, before which we were all harnessed, helmeted and gloved. With two guides and 15 clients, the 14 zip wires took a little time to negotiate and some of the adults were cool and hungry by the end. There was only one significant injury – a possible broken finger when the zip was a bit too zippy and bounced back over someone’s wayward finger. Some techniques were better than others. ‘Sit back and relax with your feet straight ahead’ seemed to be the best method. The last wire was the longest at a little over 300 metres (I would guess). 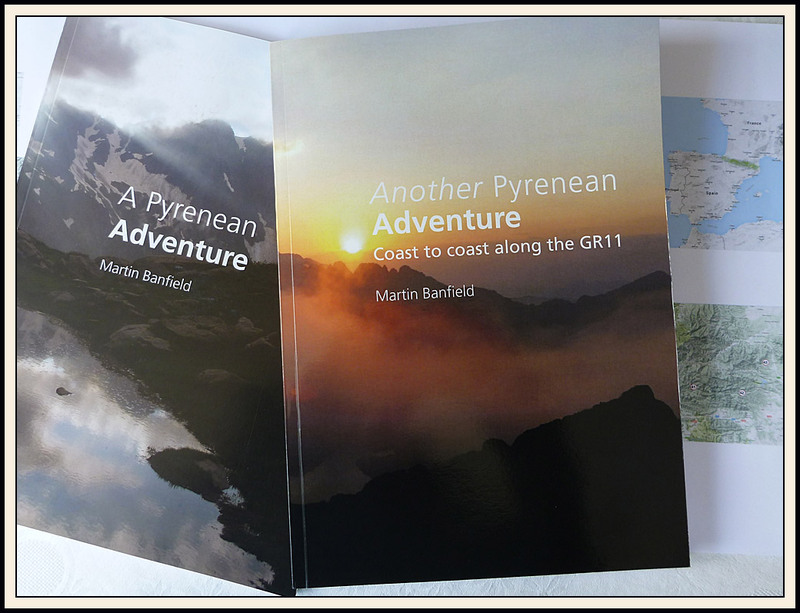 It was marginal as to whether we would do it due to the wind, but whilst it was a bit breezy and squally, it was easy enough. David was the last man down, seen here being caught by Dave from ‘G2’, with Dave’s mate operating a brake that saved David from bouncing against his spectacles like he had done earlier. He may have a black eye from that ‘flesh wound’. We soon recovered from any mild hypothermia and the many dogs were satisfactorily abluted before we headed to the Letterbox Restaurant for an excellent tasty meal. Tuesday brought indifferent weather in Newtonmore, so after a visit with Sue O to Ali and Adrian, and an otherwise leisurely morning after a late night, I stashed everything in Polly and pottered back to Timperley. Where the sun was shining and warm. Thanks go to Heather for organising this most pleasurable weekend. Celebrated with a very interesting cake and fifteen people who visited a series of 14 zip wires. Sue would have loved it. I think most of us enjoyed it, but unfortunately a finger (not mine) was damaged. Anyway, the Letterbox Restaurant provided a fine antidote, with excellent food and wine. A favourable weather forecast encouraged me to take advantage of having brought a bike on this trip. Cycling north for 9 km, from Dalnacardoch Lodge to the ruins of Sronphadruig Lodge near the Gaick Pass, saved lots of time and effort. I'd been this way before with Sue, on the TGO Challenge on a day from Dalwhinnie. Top - approaching the end of the track, with An Dun ahead. Sunshine came and went, with the Dalwhinnie Munros all visible in the middle distance. I saw nobody all day - just a sealed tent in the valley. Small birds of prey refused to come close enough to be identified. Red deer were in the woods near the A9. A grey but fine day - not a lot to add to this brief note. 18 km on the bike plus 12 km walking, with 1000 metres ascent, in about 5.5 hours. 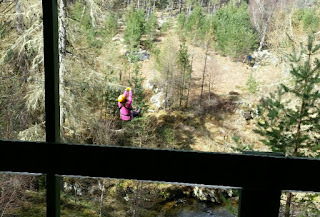 Heather and her entourage enjoyed various walks and a funicular in the Aviemore area. Meall a Buachaille may even have been conquered!